Ugh, I’ve been meaning to write up this review for ages (lately I’ve been way to busy with my research, which is good for me, but not for my blog). Back in February I got to try out one of knomo’s suitcase bags, the Marseille. I’ve been having to fly back and forth between London and the Netherlands every month for my braces, and it seemed like the perfect time to try out the Marseille. The Marseille I got to try out was a brown 19″ wheeled suitcase, which fits the exact measurements for carry-on luggage for Easyjet (which I was flying with) and most other airlines. There’s also a 24″ version, but for Easyjet that would have been too big (although I’m pretty sure with some airlines the guidelines are different). For me it was precisely what I needed: it’s as big as you can have for carry-on, yet with wheels to make it as maneuverable as possible for you. What I also liked about this mini suitcase is the design and placement of all the pockets and sections. Inside, the main compartment has pockets on the side, and the “lid” (not really sure what I should call it) has a zipper on the top and two pockets underneath that (see the photo below). On the front there’s a small pocket, with enough space for travel documents, and any hand sized gadgets. Unlike a lot of previous carry-on cases I’ve tried, that pocket is also not very deep, so you don’t have to dig for anything that you put in there. Finally, there’s a special section for your laptop, with easy acces to it (handy for security control at the airport). The laptop fits horizontally exactly into the pocket, but if you want to use a sleeve it would also fit vertically. One thing I noticed though was that if I stuffed the suitcase completely full (to be honest, maybe a little bit too full), I was forced to put the laptop vertically and the suitcase threatened to topple over each time I left it alone. I didn’t have this though when I put the laptop horizontally in, so I’m guessing that’s the “proper” way of using it. Overall, I really liked this suitcase. 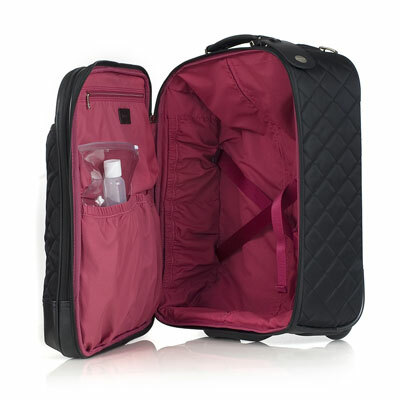 It’s great if you’re looking for a handy carry-on, plus it actually looks pretty! I’m very tempted to get one for myself, cause it’s exactly what I need for my short trips to the Netherlands. The Marseille is available on the knomo site for £165 (the brown version) or £225 (the red and black versions).